Come and listen to Dr Suzanne Imber talk about winning and her experiences on the BBC2 series Astronauts – do you have what it takes? The programme saw 12 candidates, who all have the dream to be an astronaut, being put through their paces to see who would be recommended to become a Space Agency Astronaut candidate. Dr Suzanne Imber is a 33-year-old associate professor of Planetary Science at the University of Leicester. 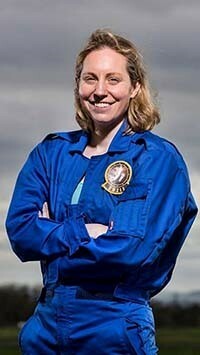 She has held posts at NASA Goddard Space Flight Centre and the University of Michigan, and is currently involved in instrument design and operation for ESA’s next mission to Mercury. Suzie is also an elite rower and a highly-experienced mountaineer. She has written computer code to identify and map unclimbed peaks in the Andes and Himalayas before setting off to climb them herself. Suzie has been interested in space from a young age, and has spent her academic career looking at our solar system – her current research looks at Mercury’s magnetosphere.